We’d love your help. Let us know what’s wrong with this preview of The Investigators of Arkham Horror by Katrina Ostrander. Discover the hidden secrets of the investigators who risk ever An essential tome for all the most daring fans of Arkham Horror, Eldritch Horror, Elder Sign, Mansions of Madness, and the other Arkham Horror Files games, The Investigators of Arkham Horror contains fifty-two short stories with full-color illustrations by more than forty of the industry's most talented artists. To ask other readers questions about The Investigators of Arkham Horror, please sign up. Does this book contain the stories of the Dark Water Series (https://www.goodreads.com/series/85955)? 3.5 stars. An aesthetically pleasing, eye-catching book. For players of the Arkham Horror board game, here's a look at some of your favorite investigators backstories. 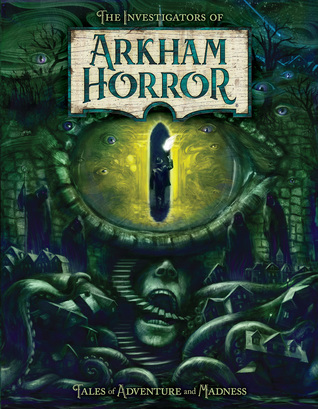 The stories contained within are brief snippets of the Mythos while primarily focusing on the environs/ locations of Arkham as depicted in the game. As a media tie-in, this is an entertaining diversion for amateur/new Mythos fans, but for a better overview, I'd recommend most readers start with HPL and work out from there. Even if the stories are not all that great, this is a usefull book for the rpg Call of Cthulhu. It depicts Arkham perfectly with evocative stories and awesome illustrations. This is one of the most beautiful book I ever read for sure! There are multiple bookcases in our house filled with books. However, there are also multiple bookcases filled with board games! Some of our favorite board games are from Arkham Horror Files by Fantasy Flight Games. Arkham Horror, Eldritch Horror, Elder Sign, Arkham Horror: The Card Game, Mansions of Madness. You name it, we’re probably playing it tonight. What makes this book so cool is that it takes every playable character from those games and gives them a short story. It works as a great coll There are multiple bookcases in our house filled with books. However, there are also multiple bookcases filled with board games! Some of our favorite board games are from Arkham Horror Files by Fantasy Flight Games. Arkham Horror, Eldritch Horror, Elder Sign, Arkham Horror: The Card Game, Mansions of Madness. You name it, we’re probably playing it tonight. What makes this book so cool is that it takes every playable character from those games and gives them a short story. It works as a great collection of Lovecraftian shorts while also fleshing out characters I’ve known for years. I've always been a huge fan of Fantasy Flight Games and the world of Arkham Horror. This book is a nice showpiece to supplement the Arkham Horror Universe. I enjoyed the short backstories of the various investigators that inhabit Arkham and I really liked the artwork. The quality of the stories is a bit uneven, but mostly enjoyable. Great for any fan of the board games tied to these characters! I thoroughly enjoyed this. A fun short story for each investigator in the Arkham Horror games? What a great idea! It did leave me wanting more. It would be really cool to have a volume 2 with another story for each investigator! Some stories were better than others. The art is great, most stories a at least good. While the idea of getting the back stories for all the characters in the game is interesting, this book ended up being pretty dull. Since the fate of the characters is in the hands of the people playing the game, none of these stories has a resolution - its a ton of stories with no endings, which makes for a frustrating read. Katrina Ostrander is a writer, editor, worldbuilder, and game master who works in the tabletop games industry for Fantasy Flight Games. In addition to her work as an editor of tie-in fiction and the story manager of FFG’s proprietary IPs, she has written for or developed over a dozen roleplaying game products, including adventures, supplements and core rulebooks.